The following article is by Kyle Frank and Bradley S. Cobb. It originally appeared in The Quarterly Vol. 1, No. 1 (January 2017). We hope you enjoy it! This sad tale follows a brown satchel. Yes, a brown satchel. For years, H. Leo Boles served the Lord as a preacher, writer, editor, and debater. In January 1946, he came down with a bout of pneumonia to go along with the phlebitis (an inflammation of a vein) which had severely hindered his mobility. However, by February, he had recovered from the pneumonia, and was successfully overcoming the phlebitis, and was expected to make a full recovery. But early in the morning of February 7, 1946, he awoke his wife and his secretary with a horrible scream of pain. He passed from this life to the next that same morning. After his unexpected death, his funeral was conducted by N.B. Hardeman, S.H. Hall, and B.C. Goodpasture. It was soon after this event that the brown satchel came into play, and the story of the lost sermons begins. H. Leo Boles wrote his sermons in brief outline form, and expanded on them as he was preaching them. They were usually typewritten, and he would often write the date and location where he used the outline at the bottom of the page. After his death, his office was cleaned out, and all of his known outlines were put into his brown satchel. Mrs. Boles, in a show of appreciation to her husband’s secretary, gave her this satchel. This secretary’s name was Miss Violet Devaney. She came from a very wealthy family, and had several sisters, but no brothers. Growing up, they all dreamed of getting married and having families of their own. However, their father had other ideas. He gave them an edict, that if they ever married, they would be completely taken out of the will, and would receive not even a penny of the family fortune. Perhaps he did this so that his daughters would find men who were more interested in them than in their inheritance. Or perhaps he was slightly off his rocker. Only God knows the answer to that. One of the daughters fell in love, and married. She was promptly removed from the will, and the father did it with such a vehemence that none of the other daughters ever became a bride. This married sister comes into play later in our story. Miss Devaney lived the quiet life of a spinster, her only real male friendship being that which she had with Brother Boles. Then he died. The years that went by were spent in relative solitude. A couple years after Boles’ death, Violet was approached by B.C. Goodpasture, editor of the Gospel Advocate, who was seeking some of the sermon outlines that he had been informed she possessed. She gave him several, and those were then published in a book called “Sermon Outlines of H. Leo Boles.” This book is no longer in print. Three decades passed, and Miss Devaney still kept that brown satchel. In the 1980s, Arthur K. Gardner approached her, asking if there were any outlines that he could use in a book on brother Boles. She gave him some, and they were published, along with a brief biography, in “The Life and Lessons of H. Leo Boles” (available from Gospel Light Publishing, Delight, Arkansas). But that brown satchel still contained more outlines that hadn’t seen the light of day since that fateful February morning in 1946. By the mid-1990s, Miss Violet Devaney was a member of the Lord’s church in Russellville, Alabama. It was here that she left this world behind, having faithfully obeyed her father’s wishes, dying an unmarried woman, and went to be in paradise, the home of the faithful. After her death, her sister—the one who had gone against her father’s edict and chose marriage and family over wealth—came to Russellville to take care of her estate. Among her worldly goods was a very old, very worn, brown satchel. This satchel remained faithful to its duty, caring for the papers and outlines entrusted to it. When Miss Devaney passed to her reward, Benny Johns was the preacher for the church in Russellville. The sons of Violet’s married sister gave him full access to the outlines to type them up and hopefully make them available to future generations. He typed them all up, but they remained unseen by the almost the rest of world for two more decades. In the late 1990s, the writer of this article was permitted to see them, and obtained a copy of each of them, which he has kept since that time, unsure of what to do with them, and how to make them available. It is now 2017, and it has been 71 years since H. Leo Boles took his final breath on this earth. 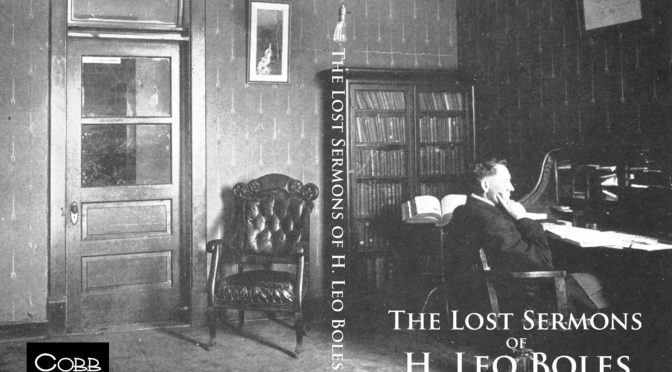 But through his writings (including his sermons), “he being dead, yet speaks.” His sermons are no longer “lost.” By the time you read this, “The Lost Sermons of H. Leo Boles” will be published for the world to see. Unfortunately, the brown satchel is lost, and probably gone forever. It is my hope that by putting these sermon outlines into print, they can be used to bring glory to God, who makes all things possible.